One of the frustrating aspects of modifying cars is that the parts that you build often don’t look as well finished as those bits already in the car. For example, if you make some new intercooling plumbing, you can really go for only two finishes – shiny (in the case of pre-formed polished aluminium or stainless steel) or rather dull and with surface imperfections showing (in the case of welded mild steel). And if you’re like me, and would like the added parts to look ‘factory’, neither is a great choice. So how do you surface-finish parts so that they look good, don’t stand out in a blingy kind of way, and are also durable? The answer is powder-coating. But it’s easy to make plenty of mistakes, so read on! 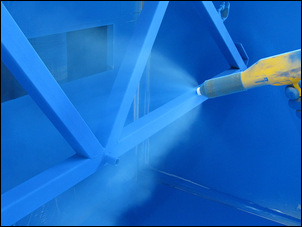 Powdercoating is an industrial process where dry plastic powder is electrostatically applied to the part being coated. The part is then placed in an oven that causes the particles to melt and flow, giving an even coverage over the part. Powdercoating is normally applied to metals – mild steel being most common. Powdercoating produces a finish that is more durable than paint, can have a variety of finishes (including gloss, matt, wrinkle and hammertone), and is available in many colours. Disadvantages over painting include higher cost, custom colours cannot usually be mixed as with the case with paint, and the fact that powdercoating is not a DIY job – you need access to a company that does the process. When powdercoating steel, it is vital that a proper, rust-preventing undercoat is applied to the part prior to powdercoating. Powdercoating applied over bare steel will look good for a year or two, then the rust that’s started underneath the powdercoating will cause the top coat to lift and bubble. Note that some powdercoaters are quite happy to powdercoat bare steel – you must always check that the part is being undercoated first! 1) The slightly roughened finish gives the powdercoat a better surface onto which it can grip. 2) The blasted surface is very clean. There is no dirt, brazing flux or scale left on the part that could later lift under the powdercoat. 3) Sanding and file marks will be reduced. Note that Step 1 and 2 should occur in quick succession – don’t leave the part around to develop even vestigial surface corrosion before undercoating it. 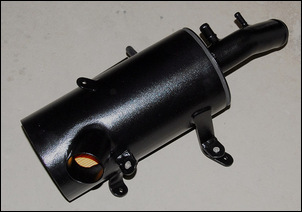 If the one company cannot blast, undercoat and powdercoat, you may need to be able to quickly transfer parts between companies. Let’s look at the process of surface finishing some underbonnet steel parts. The parts will be treated to a dose of wrinkle black powdercoating. Use of a wrinkle finish means that the parts don’t need to be finished to the level required with, say, painting. For example, there can be some fine sanding marks left on the item. Here is a fabricated airbox. It was made from steel truck exhaust tube, 150mm in diameter. The removable lid (right) and end cap (left, out of view) were fabricated from steel sheet. The entrance tube (with the plastic bellmouth) was MIG welded to the wall of the tube. The mounting lugs were also welded to the wall. All welds were then ground back with a flap sanding discs working in an angle grinder. The sanding marks are still visible – getting rid of these would require hours of extra work. Here is the same airbox in finished form. 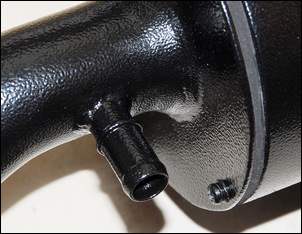 The part was carefully blasted (it is easy to cause warping and erode too much material when blasting thin gauge metal) and then immediately painted with a zinc-rich undercoat. Wrinkle black powdercoating was then applied. The part looks super professional – no surface imperfections are now visible. Also coated was the inside of the airbox. 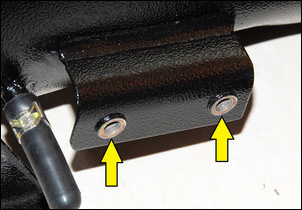 Note that where the part has holes tapped with threads (nutserts have been used here), a sacrificial bolt should be placed in the threaded hole to protect the thread from the blasting and powdercoating. When the part is finished, the bolt can be unscrewed and thrown away (or retained if you want a bolt with a powdercoated head!). 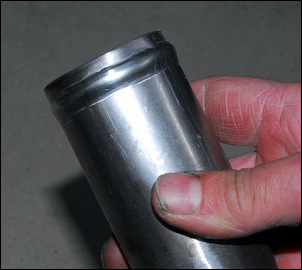 This vent tube was brazed to the steel exhaust plumbing used to form the airbox exit. No sanding was carried out on the braze weld but after blasting and powdercoating, it looks fine. Here is an alternator mount after blasting, but before undercoating and powdercoating. It was fabricated from steel plate and bar, MIG welded together. Steel bushes were brazed to the steel plate – the braze is the yellowy-gold material you can see on the steel. Most welds were ground back (primarily for clearance) but some welds were left as welded. 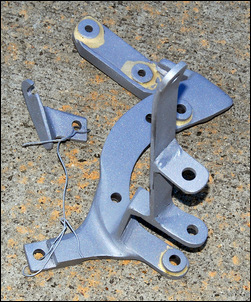 Note the extra part attached to the main bracket with wire – the two pieces were left attached during blasting but separated for undercoating and powdercoating. Wiring them together means there’s less chance the small part will get lost! 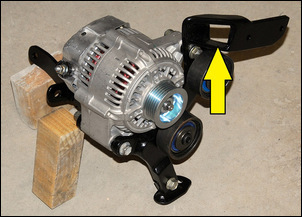 Here is the alternator mount in finished form. Note that the surface finish is excellent, even in the arrowed recess where it was nearly impossible to adequately sand the steel. This is a major advantage of the blasting-undercoating-powdercoating approach: you can surface finish areas that are hard to get to. 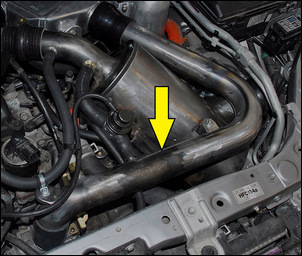 Here is an intercooler-to-throttle body tube. It was made from mild steel mandrel exhaust bends, welded together. The welds were made with an oxy torch, ground back and then any imperfections filled with braze and then again ground back. Despite this care, some surface imperfections and sanding marks are still visible on the item. 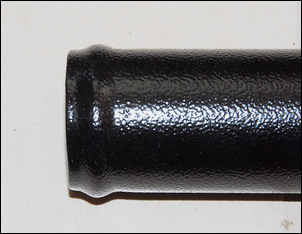 A bead formed on the end of the tube with a home-made beading tool (see Make your own tube beader). If you look closely, you can see scratches and other marks left by the tool. Sanding these out would reduce the (already thin) wall thickness of the tube. The intercooler (and turbo inlet) plumbing in finished form. Note how it’s now impossible to see where the bends were welded together, and the mounting tabs and fittings (brazed to the tube) now look good. The bead after blasting, undercoating and powdercoating. The scratches are no longer visible. Surface finishing parts in this way is not a cheap process. 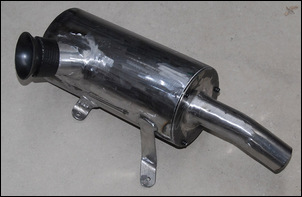 The parts shown here, plus another half dozen of similar size, cost AUD$120 to blast and $210 to undercoat and powdercoat. To put this another way, the finishing process cost more than the original materials! 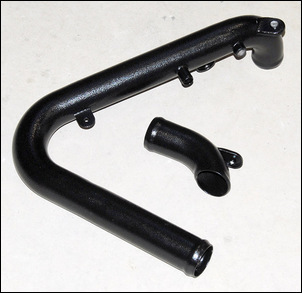 However, if you want a professional looking end result that is also durable and corrosion resistant, the process of blasting, undercoating and powdercoating gives fantastic results.